I thought I would make a WordPress plugin to solve these problems. It was a great opportunity to refresh my knowledge about the system – I hadn’t used WordPress for three years! Surprisingly, it took me only 5 hours to do everything from scratch, but I wanted to leave an article I can go back to as a reference. You can get the plugin from my GitHub repository: https://github.com/kantoniak/kantoniak-project-description/. Update: Plugin is already available here: https://wordpress.org/plugins/project-description/.To install it from the dashboard, go to Plugins/Add New, change search criteria to Author and look for kantoniak. Has a list of entries from the category, so people can quickly switch between articles. Also, it allows the reader to see the project progress just by glancing the titles. 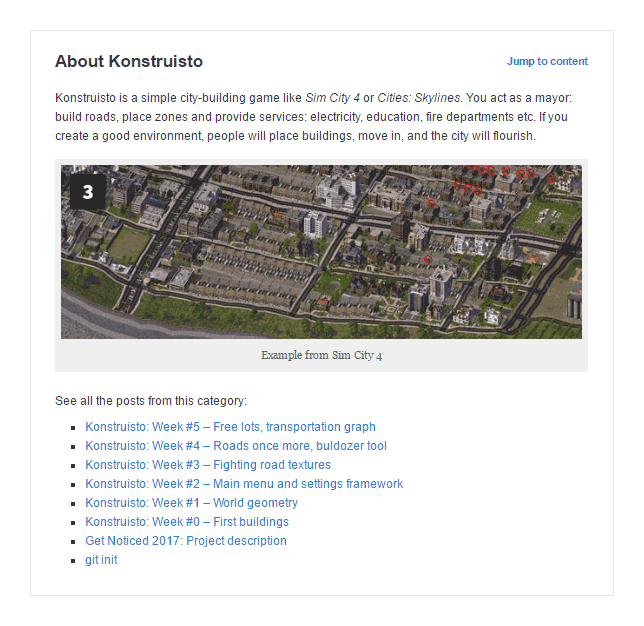 Go to Konstruisto category to see it in action. Description: This plugin adds project description at the top of the article. The way extensions work is to wait for an event and then execute code. There are two types of hooks: action, to add custom features to the project, and filters, to modify data before it goes to the next filter or the renderer. Inside the hooks, there are various functions we call. Some of them depend on the global state, e.g. we cannot call the_title(); unless post data is setup (e.g. we are in the middle of rendering post page). This one is a bit trickier since there is no hook triggered just before rendering articles. I decided to change category description on the fly, as many templates render it just after the title. Further filters will receive the content we returned. Possible problem is that we return HTML code whereas Category description in WordPress admin is a regular chunk of text. Wonderful get_posts() solves the problem for us. Worth noticing, it returns only 5 posts by default. It has a lot of options. There is an action admin_menu for registering new pages. We call add_options_page() giving a callback to a handler function. WordPress suggest using Settings API to handle options, but after the article on WPShout and a few minutes of checking myself, I decided just to render plain HTML since I needed only a few fields. Styles in WordPress have handles, it’s a good practice to use something unique like plugin slug name. That’s all you need to write a WordPress plugin, the rest is a simple PHP code. Check the main file of the plugin to see how to pass method callbacks etc.